My Sundays are usually spent recovering from an event or off to another event, not for wandering through the Coventry Farmer's Market, as much as I would like too. Last Sunday was one of those rare open days for me (been on a quest to balance between work & family) and of course I packed up the family and went to the Flea Market in Mansfield, followed by the Coventry Farmer's Market and finished off our adventure by meeting friends for lunch at Fay's Place. The market was PACKED!! We gathered up the fruits and veggies we needed for our new juicer, said hello to a few llamas and onto lunch we went. 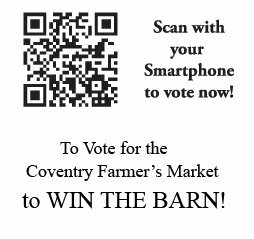 What I loved about our visit, was how almost every vendor had the Great Barn Giveaway on their tents, friends of the market were sharing high tech Q code cards for voting and it was a great sense of community. 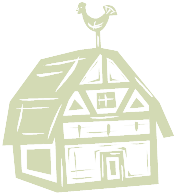 This barn will benefit the farmer's market of course but also the Nathan Hale Homestead. As a business sponsor (my second year, granted last year I was only a friend of the market. I missed the deadline, yes it even happens to us planners at times.) I want to see them succeed. So many really go beyond what you would expect to make sure this market runs as smoothly as it does.